At the end, it is women who sustain each other. ‘Roma’ looks at the role of the female domestic help that the economically better-off hire to serve their needs. A maid’s role is private and personal, contained between her employers and herself, their interaction is hidden within the walls and spaces that both serve. It is also a world contained in silence and endurance. 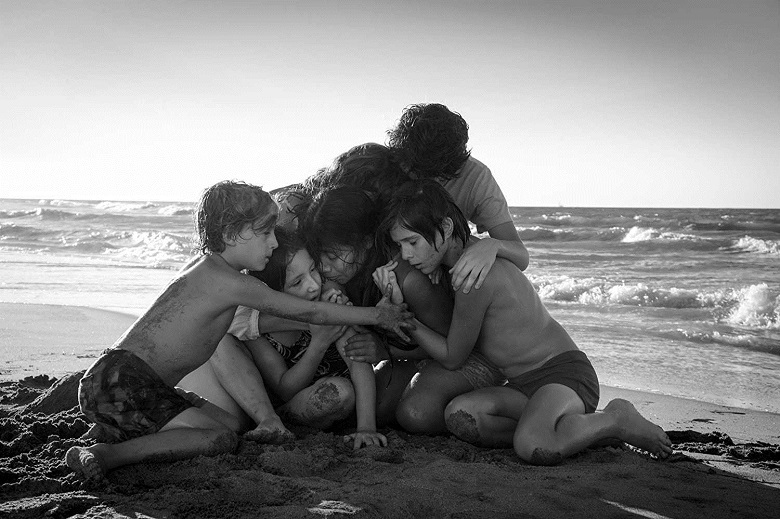 ‘Roma’ gives it a voice and brings it to us, larger than life. 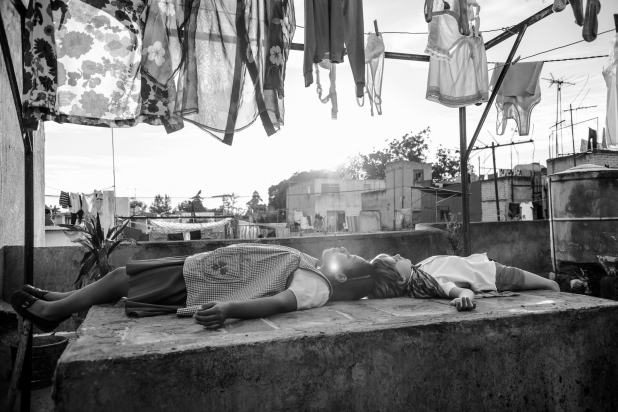 ‘Roma’ is said to have stirred the conscience of homemakers in Mexico, making them look more closely at the human needs and emotional constraints of their staff. While Indian films have been made on the employer-employee status, Shyam Benegal’s stirring ‘Ankur’, 1975, B Narsing Rao’s ‘Daasi’, 1988, and this year’s ‘Sir’ directed by Rohena Gera, their impact on viewers has not been commented upon. That ‘Roma’ has moved viewers in a socially conscious way lifts cinema to another level. The need is for Indian cinema to stimulate a sense and also a sensitivity to India’s many-layered social inequalities. Falling seamlessly into this category is the most talked-about international film of 2018, the Mexican film ‘Roma’, written and directed by Alfonso Cuarón, who also produced, co-edited and photographed the film. The title refers to a particular section of the city called the Colonia Roma. Set in the early 1970s, the film follows the life of Cleo, a live-in housekeeper working for a middle-class family. For Indians, hiring domestic help is common enough. In Mexico, Cleo and Adela are both maids who take care of the household chores between them. They serve a family headed by Antonio, a doctor, his wife Sofia and their four young children, besides Sofia’s mother who also stays with them. And Cleo does exactly what a house help would do in a metro city in India, where staff quarters attached to a residential house is customary in certain neighbourhoods. As employees, the women earn and live better, but their caste and creed matter to varying degrees. ‘Roma’ is both heartfelt and hard-hitting without in any way making an issue of what it is delineating. It does so without on-screen enticements of major stars, a running background score, or the lure of being in colour. The film rises above all these embellishments despite being in black and white, used so alluringly that the image on the screen is all powerful. The film’s main protagonist is the dedicated and caring Mexican maid, Cleo, played by school-teacher Yalitza Aparicio, acting for the first time giving a stellar performance. The director is said to have auditioned some 800 aspirants over a year for the right person to play the role. Aparicio lives and breathes the role to perfection. The film starts with the maid going resolutely over her daily chores as she cleans, swabs and does the laundry. Sophia’s young son joins her playfully, displaying their mutual affection. The film then opens its lens to Cleo’s bonding with all other family members. Cleo tends in every way to the family - cooking, cleaning, dressing the children for school, taking them there and back, seeing to their dinner and preparing them for bed. While she makes the children feel secure, we learn that their parent’s marriage is strained. In their free time, Cleo and Adela date their respective boyfriends, Fermín and Ramón. On one such date, they plan to see a play but Cleo and Fermín decide to rent a room instead, where a naked Fermín displays his prowess at martial arts. On another day, while at a movie house, Cleo tells Fermín that she may be pregnant. He leaves for the washroom but does not return. Cleo confides in Sofia, who takes her to Antonio’s hospital to confirm her pregnancy. Sofia takes her two maids and children to a family friend's New Year’s Eve celebration where the confrontation between landowners and workers is apparent. A forest fire erupts even as 1970 makes way for the new year. Back home, Cleo goes with the children and their grandmother to a see the film ‘Marooned’, where Antonio avoids them as he is with a young woman. He later tells his shaken wife that he is leaving her for good. Her older son eavesdrops on their conversation. She urges him not to tell his siblings, who believe their father is away on business. Cleo searches for the elusive Fermín and finds him at an outdoor martial arts training class. He bluntly, even brutally, rebuffs her denying that she is carrying his baby and warns her to stay away from him. On her way to buy a crib, Cleo sees street protests by students, who then invade the store she is in. The police enter firing at young rebels who could be part of the paramilitary group Los Halcones and kill a wounded man taking shelter. As one of them turns a gun on her, Cleo's water-bag breaks. The on-going turbulence delays the car driver’s attempts to make it to the hospital. Cleo is taken to the delivery room where Antonio arrives briefly to console her. The doctors hear no heartbeat. Cleo holds her stillborn girl child to her chest for a brief while. Now on her own, Sofia takes a last trip in the big family car that she plans to sell. They head out for a holiday by the beach. She shares her grief at her husband leaving her, first with Cleo and then with her children. The two middle children are caught in high-rising waves and Cleo rushes in to save them from drowning, although she cannot swim. As Sofia and her children embrace her for her selfless concern and care, she is in her own world, confessing that she never really wanted her baby. Back home, Cleo prepares a load of washing, telling Adela she has much to tell her. And as seen in the opening shots, a plane flies overhead. 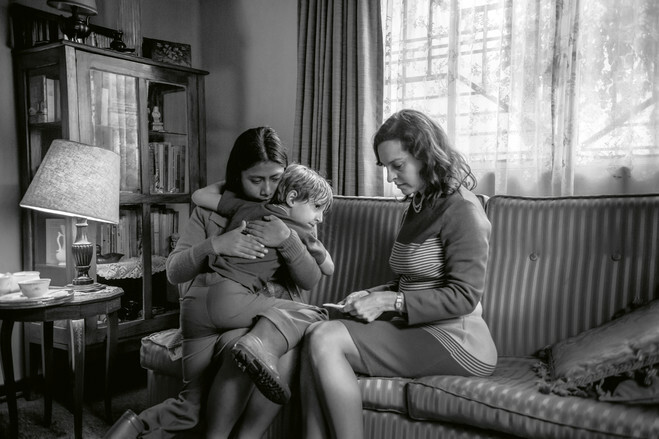 ‘Roma’ stays with you as a finely observed human document of how women live for their men, and when deserted and bereft, they have only each other for support. In the end, it would seem, it is women who sustain one another.